Some time ago, on a noon quite brightly lit by Jakarta’s sun, we had a chance to chat with one whom can be called a young musical “figure” who grew up on the streets. His name is Wukir, and he is originally from Solo, Central Java. At the time what I knew was that he is a musician as well as a maker of his own musical instrument, which consisted of a block of bamboo with strings encompassing its surface. 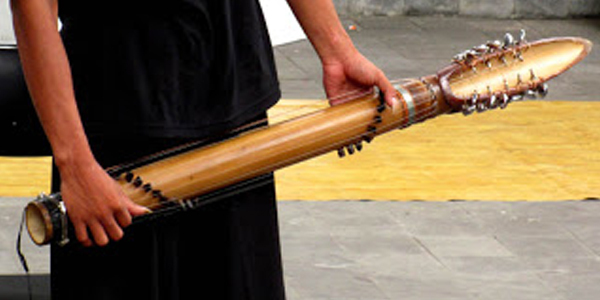 Maybe it would be easier to imagine it as somewhat like a lute, but with a cylindrical resonating body (the cylinder in this case being a large piece of bamboo). Just imagining what musical creations could be created had already excited me. But what further made me want to chat directly with him is his courage in traversing the world of music from street to street armed only with an (unproven though unique) instrument that he made himself, which of course created his own unique sound. When I place myself within the point of view of a layman, a question raised in my mind was how is it that a street musician, someone who would be shackled by financial issues as well as issues of (formal) education, would have the bravery to create his own instrument and play his own original works with full confidence? Before heading for the answer, it would be prudent to first get to know the friends who helped Wukir travel his musical journey so far. For one whole month in Jakarta, Wukir stayed at his friends’ home, Yanuar, near Bintaro, South Jakarta. He brought his wife and a friend, Cunong, from Solo. “Jakartas is hot. I can’t stand it here,” said Cunong when I asked him what he thought of Jakarta at the time. Wukir’s wife would also do no more than laugh in agreement. It is true that at the time the sun above Jakarta seemed unrelentingly bright. And for those not used to it, I am sure it would be difficult to find comfort living here. Yanuar, Wukir’s wife, and Cunong, are youths who paved their life paths on the road of the arts. Yanuar introduced himself as a djembe music player at a capoeira martial arts school in Jakarta; and during Wukir’s stay in Jakarta, he was responsible for helping arrange performance schedules and for promoting them so that Wukir could perform and spread his musical works maximally. Meanwhile Wukir’s wife is also a singer who often performed in collaboration with Wukir in his various shows, including in Jakarta at this time. And Cunong, it turns out aside from his involvement in various music shows in Solo, he also had written some music works himself. In my point of view, together with Wukir, the three of them are a “family” that are inseparable in the context of their functions and roles, vision and mission, and in self exploration in questioning, seeking, and living out their lives as part of society. Once again things such as limited finances and the gap in (formal) education which I had mentioned earlier, these were no longer relevant to this discussion when we witness the courage and strong will of these our friends from Solo. And so the next question is, where does this courage come from? Wukir, whose full name is Wukir Suryadi, is a youth born in Malang, East Java, 32 years ago. 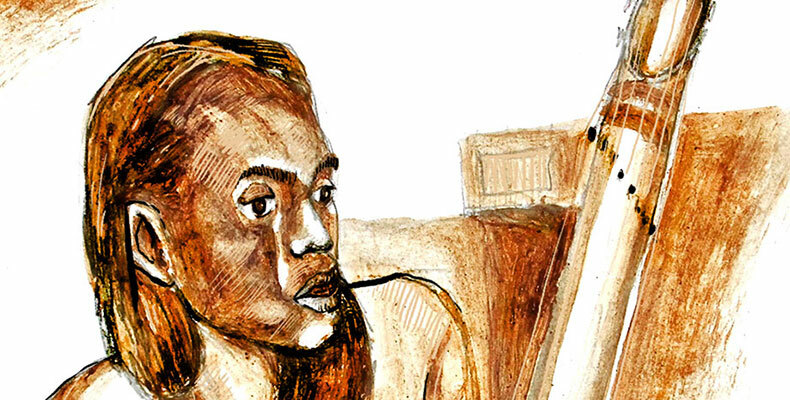 “I have known music ever since elementary school,” explained Wukir. At the age of 12, he began learning and delving into the art world through various roles in an art exhibition, specifically through a musical theater, where he took roles in lighting and eventually as music director. “From a theater performance, I learned a whole lot. Especially about the role of sounds and how each actor responds to them,” answered Wukir, when asked for the beginning of his interest in music. “…so music to me had become more than just simply a series of rhythms and melodies that are enjoyable to hear, but instead it has become like all the sounds we hear out there… like nature [itself]!” He continued. With such an understanding and consciousness of musicality, from one region to the next, from city to city, from street to street. From his teenage years until this moment, Wukir had developed his musical knowledge and attitudes through various experiences in taking the stage at almost all areas of Java island. A part of them as the music director at Teater Ideot Malang and at Teater Bangkit at Universitas Islam Malang, in collaboration with the Theater of IKIP Surabaya, and then joining Rendra’s Bengkel Theater as lighting coordinator in the show “Kereta Kencana”, in collaboration with batik makers at Warung Apresiasi Bulungan, Jakarta, and taking part in various music groups such as Pitara (Depok, West Java), Bloko Suto at Cipayung, Blok M Akustik (Jakarta), Main Tenan (Solo), and as musician lead by music director I Wayan Sadra in the Bengkel Teater Rendra performance of “SOBRAT” by Artur S. Nalan, directed by WS. Rendra. In his various journeys, he often explored sounds through percussion instruments and unusual implements used as music instruments, such as playing with bottle caps (kempyeng), clay pots, mechanical drills and blenders; modifying musical instruments such as gaping (a modification of the rebab), gestik (a modification of the rebab fused with an air rifle), and he also designed his own such as gestong, tarmbu (a guitar made of bamboo), until in 2009 he created his own unique instrument which he continues to develop to this day, which he named the Bambu Wukir. As a designer and true ‘owner’ of his own musical instrument, not to mention as a songwriter and as a performer—something that would be very hard to achieve in the West even, if without incredibly big dedication, determination, talent and commitment—of course Wukir’s musical process is far from over. When asked what is the final goal of his musical efforts all this time, he was at a loss for words. As an instrument maker, songwriter, and a player, on one side it would make us imagine Wukir to be a very creative artist. But on the other side, he also carries an incredibly large responsibility towards the public upon his achievements; especially once he is facing the international world. In the West, if only just to become ‘a mere player’ you would already be required to obtain the correct set of skills and means to reach perfection in playing, such as contextual and proper musical knowledge, not to mention talent, dedication, and strong commitment. The same if you wanted to write songs, or to make instruments. Proper understanding, focus, and goals, these are things which has made the music industry ecosystem in the west so dynamic, and has inspired (and conquered) the world continuously. Then when we see the condition of the music ‘industry’ in Indonesia at this moment, of course Wukir’s role and function as an actor within it is of course quite a challenge to him. Meaning, this final musical goal would be hard to achieve without the proper tools to reach them. Identifying the problems he face, focus, and sacrifice become very crucial in Wukir’s career path today. Wukir and his bamboo, his wife, and also his fellow comrade in arms seems as if they had given me a hard slap; me, a person that came from a well-t0-do family. That poverty is not at all about material possession, fate, or social status. But poverty and dependency is when we cannot see and develop the potential that lies inside within each of us. Society, or anyone at all could at any time take away our material wealth (read: money) and status; but with conviction I say, nothing can take away each our own self potential and independence from us. Truly, meeting Wukir and any friends who walk the same path of conviction as us is truly a priceless learning experience.